111.043 and 111.025 accelerated away from Prien am Chiemsee with M79009, the 07:55 from München Hbf to Salzburg Hbf on 2 April 2014. Photographing these loco hauled substitutions for new Meridian EMUs was the main reason for my trip to Germany. ÖBB Railjets are a common sight on the Salzburg - Rosenheim line. 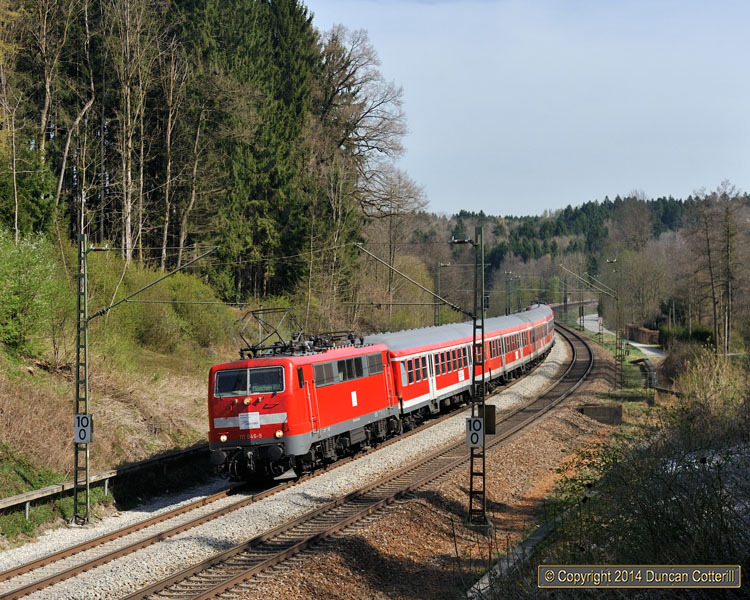 1116.229 sped train RJ262, the 08:30 from Wien Westbf to München Hbf through the woods near Inzenham, west of Bad Endorf, on the morning of 2 April 2014. 101.104 accelerated away from Prien am Chiemsee with EC115, the 06:31 from Münster (Westf) Hbf to Klagenfurt Hbf, on 2 April 2014. The same loco works this service throughout its 15 hour journey, despite reversals at Stuttgart and München. 111.025 and 111.043 rounded the big curve at Weisham, between Bernau and Prien am Chiemsee with M79034, the 15:12 from Salzburg Hbf to München Hbf, on 2 April 2014. This was one of the few days when the air was clear enough to get a good view of the snowcapped peak of the Hochgern (1748m) although it's only 15km from the photo position. In October 2013 it was high grass along the line side that obscured the view but it had all been cleared by April this year. Lokomotion's 185.666 piloted 186.286 on a southbound intermodal at Vogl, north of Großkarolinenfeld on 3 April 2014. Lokomotion was the most visible of the independent operators around Rosenheim and its locos were often seen in the company of Railpool engines. Still with Railion branding, 185.262 passed Etzing, a few km east of Rosenheim, on an eastbound intermodal on 3 April 2014. 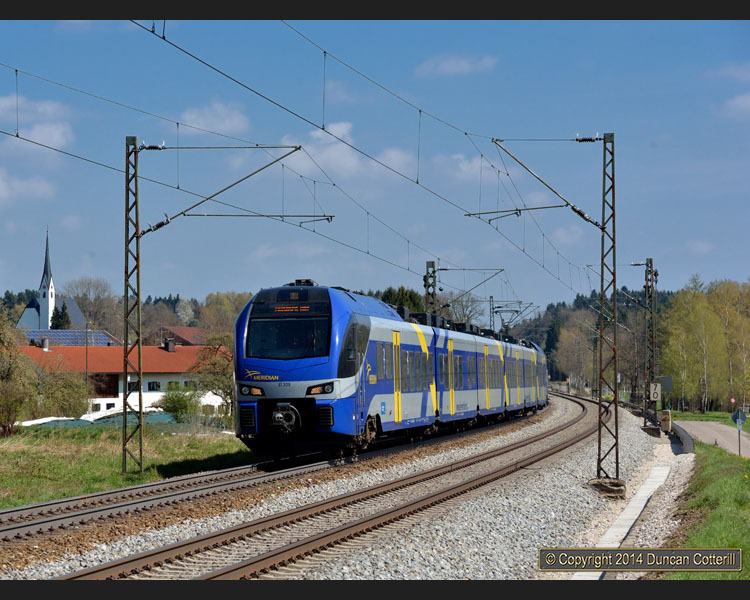 Ten kilometres east of Rosenheim, 111.046 and 111.049 negotiated an S-bend in the woods along the west shore of the Simssee with train M79022, the 10:12 Salzburg - München Meridian service. The photo was taken near Inzenham on 3 April 2014. 111.051 was about to depart München Hbf on the rear of M79045, the 21:44 to Salzburg Hbf, with 111.019 on the front. It was Friday 4 April 2014 and this would be the last time this particular train was booked to be loco hauled and the last revenue working for these two locos in Meridian service. Friday evenings see a class 103 used to haul CNL1286, the 21:46 from München Ost to Hamburg-Altona on the first short leg of its journey, as far as München Hbf. 103.245 was in charge on 4 April 2013 and is seen here after arrival at the Hauptbahnhof. Saturday 5 April was the last day of loco hauled substitutions on the München - Salzburg route but only one set was required to work. The locos and stock of the other two sets worked back from Freilassing, where they had stabled overnight, to München. 111.051 and 111.043 dragged 111.025, 12 coaches and 111.019 past Baierbach, east of Rosenheim. Dispolok 182.596 was looking a bit unloved as it passed Gutmart, north of Großkarolinenfeld, with a long train of vans on the morning of 7 April 2014. It was good to see a few Swiss locos from SBB Cargo and BLS Cargo adding to the variety around Rosenheim, although they were probably on hire to other operators. SBBC's 482.030 added a splash of colour to the scene as it hustled a string of oil tanks south past Gutmart, north of Großkarolinenfeld, on 7 April 2014. Trenitalia's E412.019 and E412.017 went south with a train of tank wagons on the morning of 7 April 2014 and were photographed passing Gutmart, north of Großkarolinenfeld. DB's veteran class 151 freight locos still work a handful of trains in the Rosenheim area but this was the only occasion I got a good shot of one. 151.148 dragged a long train of gondolas southwards past Gutmart on 7 April 2014. After the last loco hauled Meridian trains had run, the whole service was operated by these 6-section articulated class 430 EMUs. 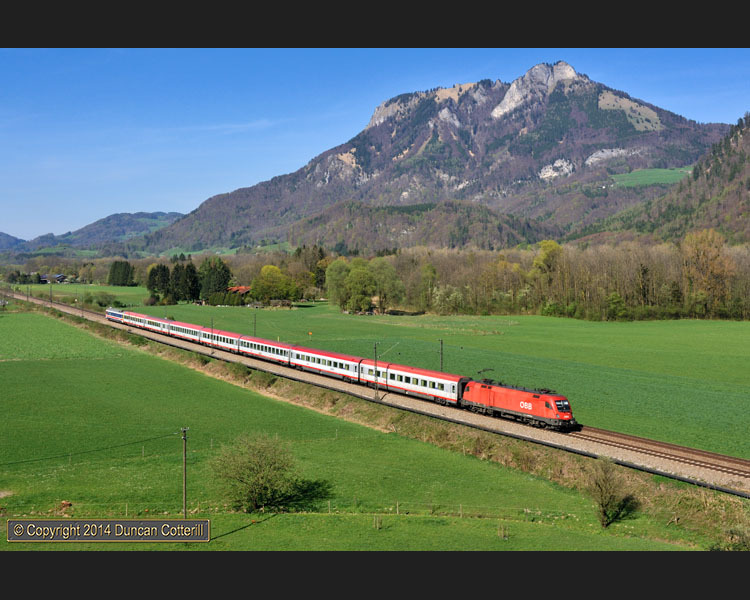 430.009 passed Baierbach, east of Rosenheim, with M79024, the 11:12 Salzburg - München, on 7 April 2014. Internal Austrian InterCity services from Salzburg to Innsbruck save over 2 hours by running via Rosenheim instead of following an all-Austrian routing via Zell am See. 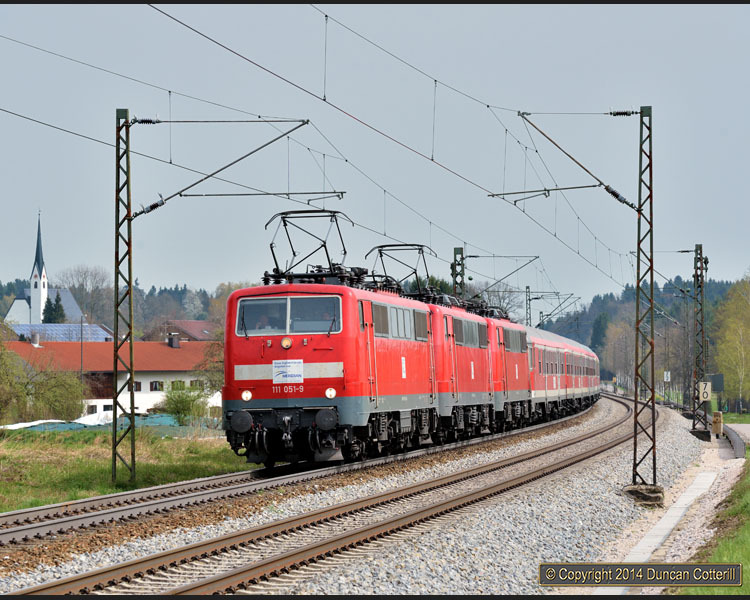 A faded 1116.079 led IC864, the 11:56 from Wien Westbf to Bregenz up the Inn Valley south of Flintsbach on 7 April 2014. The last vehicle in the train is a test coach. 1116.252 passed Kloster Reisach, a Carmelite priory near Niederaudorf, with IC961, the 14:03 from Bregenz to Wien Westbf, on 7 April 2014. At the right hand edge of the picture a newly erected noise barrier can be seen, presumably designed to protect local inhabitants from raucous hymn singing. Flights from London Gatwick to München were with easyJet. Local transport was by hire car although the trains were used for a day. Accomodation was at the Hotel Goldener Hirsch, in the centre of Rosenheim and within easy walking distance of the station. Work international services from Budapest or Wien to München or Zürich. Also work some internal Austrian services from Wien to Innsbruck or Bregenz, including IC862. The class 1116 loco was always at the west end of the set although sometimes the loco was the wrong way round with the grey end leading. One train RJ67 on 01/04/14 was worked by 1116.157, a standard red loco, on a RailJet set. Work internal Austrian IC trains from Wien to Innsbruck or Bregenz (those that aren't RailJets). Work around half EC services from Graz, Klagenfurt etc to München, Frankfurt etc. Work all EC services from München to northern Italy as far as Brenner/Brennero where a 1216 takes over. Work around half EC services from Graz, Klagenfurt etc to Frankfurt, Dortmund, Saarbrücken etc. The loco was always at the east end of the set. Work IC2082 and IC2083 Berchtesgaden to Hamburg and back. 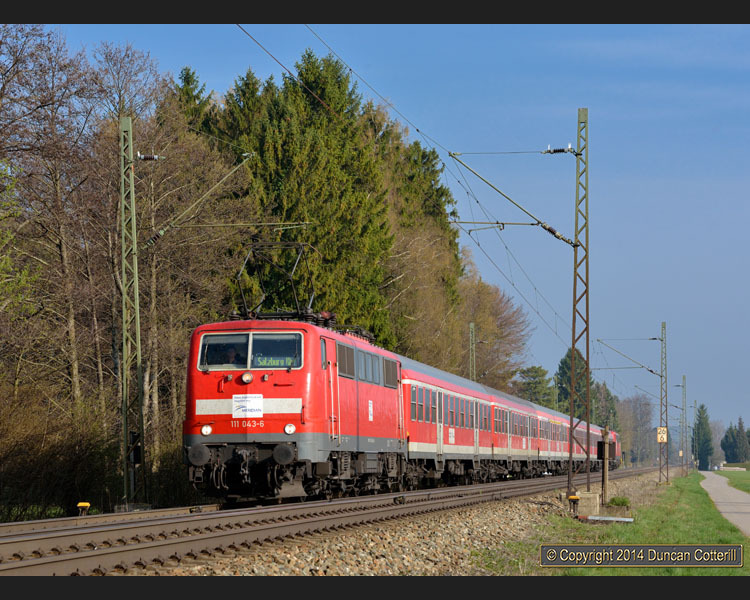 DB 120.135 was used on IC2083 on 01/04/14 and IC2082 on 02/04/14. 3 weekday diagrams covering 9 return trips from München to Salzburg and back. 1 weekend diagram covering 4 return trips from München and Salzburg and back. Finished on 5 April with 111.046+111.049 working the final Saturday diagram. 1 weekday diagrams covering 3 return trips from München to Kufstein and back, 4 return trips on Fridays. Finished sometime before Friday 4 April. Very heavy freight traffic on the Salzburg route until Saturday 5 April due to diversions from Wels - Passau - Regensburg. It wasn't abnormal to see 6 freights in an hour east of Rosenheim. Freight traffic between Rosenheim and Kufstein was lighter than expected on Monday 7 and Tuesday 8 April, less than one train each way an hour. Intermodal traffic predominated, mainly in block trains. Containers, swap bodies and complete lorry trailers were all seen. Block trains of car carriers, coal hoppers, grain hoppers, oil tanks, cement tanks, chemical tanks and vans were all seen as well as mixed freights. DB Class 185 and ÖBB Class 1116 were the most common types seen. A handful of DB Class 151, 152, 189 and a single ÖBB Class 1144 were also seen. Other operators worked about a third of the traffic with locos of classes 182, 185, 186 and 189 belonging to Railpool or MRCE Dispolok predominating. Lokomotion was the most commonly seen operator, either using their own locos or those belonging to Railpool. Both SBB Cargo Class 485 and BLS Cargo Class 486 were regular performers on trains heading for the Brenner Pass. Other interesting types seen were a pair of TrenItalia Class E412s, a few Railpool or Dispolok Vectrons and an old DB Class 194. Rosenheim to Salzburg is very photogenic, particularly east of Traunstein and between Bernau and Prien. There are a number of good positions north of Rosenheim between Großkarolinenfeld and Ostermünchen but not much any further north. South of Rosenheim, the Kufstein line is difficult but there are some excellent positions north of Oberaudorf. Visibility was poor most of the time with Saharan dust in the atmosphere to blame. There were a couple of fairly clear sunny days but the weather was far cloudier than forecast most of the time. It was sometimes difficult to move on after getting a few shots at a good location in the knowledge that there was likely to be another train along in a few minutes - a problem I could live with! The best locations are a long way from the nearest station, often around an hour's brisk walk, so it would be a push to do justice to the line travelling by train and walking. 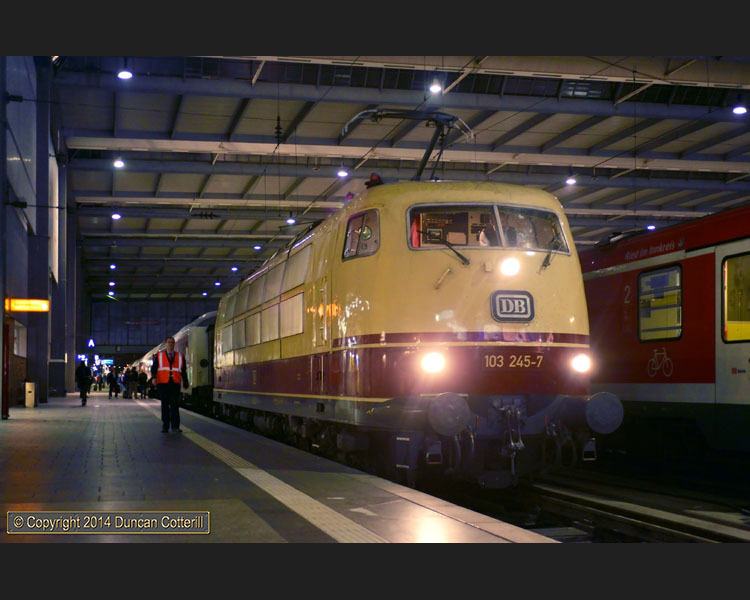 The evening of Friday 4 April was spent photographing at München Hbf. 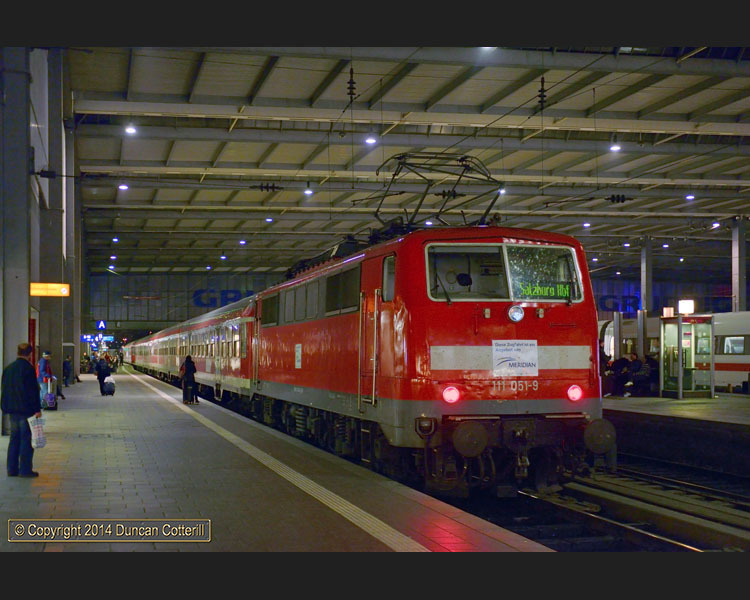 As hoped, 103.245 worked in from München Ost with the stock for CNL1286 to Hamburg-Altona. Apart from the Salzburg trains, there were very few 111s around but lots of shiny new class 440 or 442 units. The lighting under the train shed was poorer than expected but still just about enough for successful photography. No problems with photography despite the very visible presence of police and railway security goons. Most services worked by class 427 Flirts. Four loco hauled trains a day - two ICs and two regional services to work the stock from/to Freilassing. Nice locations around Winkl between Bayerisch Gmain and Bischofswiesen. Less than 50% sunshine but there were so many trains that I still came away well satisfied with what I got. Even without the diverted freights, the Salzburg line would have been well worth a visit with excellent photo positions, lots of traffic and plenty of variety. It's sad to see the 111s finish on the München - Salzburg route as they've been a fixture since my first visit in the mid 1970s. Highly recommended to anyone aiming to photograph electric locos in good scenic locations but getting to the spots would be hard work unless you have a car. If anyone does plan visiting this area with a car, it's worth noting that fuel is almost 20 cents a litre cheaper just over the border in Austria. Left home at 02:50, drove to Gatwick, parked, bussed to the airport, checked in and straight through security, reaching the departure lounge at 04:25. Well worth the extra speedy boarding fee to miss the queues. EasyJet was into München slightly early then another quick trip through immigration, a short wait for bags and at the car hire desk but still on the road by around 10:00. Straight down the Autobahn to Burghartsöd, between Traunstein and Tiesendorf, for my first train at 11:40. This was a location I'd visited before, and, as I was feeling tired, I stayed for four hours before moving on. The hoped for class 111s turned up on their expected trains, unfortunately with Meridian stickers over the DB logos, which didn't enhance the pics but did put them into historical context. No less than 23 freights were recorded over 4 hours at Burkhartsöd, plus 21 loco worked passengers (and I missed some). Busy or what? The light was bright but it was hazy and the mountains that should have been in the background for shots of westbounds were lost in the murk. My second location was equally unadventurous and again somewhere I'd been before. However it might as well have been a new location as the high grass that ruined most of the potential positions last October had been cleared, opening up many more possibilities. There was a slight change from the 111 plan as the third set worked a later peak hour train than expected, M79035, 17:29 München - Traunstein instead of M79031 at 16:35. This was repeated on the Wednesday but not the Friday. No less than 8 freights and 11 loco hauled passengers were noted in around 2 hours, again with several more that were missed. Apart from the 111s, all the regional passengers were worked by new class 430 units, 6-car articulated sets built by Stadler and finished in a grey and blue livery. Some peak hour services were formed of two sets. Long distance passengers came in three varieties. Around half were ÖBB RailJets, invariably with the loco at the west end and quite a few were double sets with a second loco in the middle. One set had a red livery loco, the rest were in RailJet colours but the loco was often the wrong way round with the grey end leading instead of the red end. The Railjets worked hourly services from Wien, generally to either to Zürich or München, and also some internal Austrian services. Many of the remaining services were worked by ÖBB 1016s or 1116s on conventional stock, including some services to destinations in Germany as well as internal Austrian ICs. EC112 and 113 were top'n'tailed, presumably to simplify the reversals at München and Stuttgart. IC2083 from Hamburg to Berchtesgaden was worked by a 120 instead of the expected ÖBB class 1016. Remaining long distance passengers were worked by DB 101s on push-pull sets with the loco always at the east end. Freight power was also varied although 17 out of the 31 freights noted were powered by DB 185s. A 151 worked pick up freights in both directions. There were also 4 trains with ÖBB 1016 or 1116, one of which was piloted by a 1144. Two trains were worked by independent operators' 182s, six by 185s and one by a 193. A better day weather-wise with good or hazy sun most of the day. Visibility wasn't brilliant but was better than on the Tuesday. Started photting where I'd left off the previous day, south of Prien. After a couple of hours I went to look for a spot between Bad Endorf and Rosenheim where the light would be right for the second 111 set returning to München and found an excellent position in the woods on the west shore of the Simssee near Inzenham. The next location tried was Mauerkirchen, E of Bad Endorf but it wasn't as good as anticipated so I only stayed for a couple of trains. Bernau am Chiemsee followed, again without too much success. By this time the light was further round and with the mountains a lot more visible, it seemed a good idea to go back to somewhere I knew would be good, Weisham, south of Prien. Unfortunately the incessant stream of freights dried up in mid-afternoon but things did pick up again later. All the above was intended to ensure I was in position for the 111 workings but wasn't entirely successful in that regard. Quickly gave up on trying to record every train as there were so many, only noted those when I was in position. Everything that passed while I was on the move was ignored as it would have meant too many delays if I'd stopped to write them all down. Similar patterns of freight and passenger to the previous day with similar classes. 111s worked exactly as the previous day including the 17:29 to Traunstein, not the 16:35. A good start weather wise with some excellent light during the morning. The sky clouded up around midday although there was hazy sun at times for the next couple of hours before it became universally dull. Went to look at some new spots between Großkarolinenfeld and Ostermünchen on the line to München in the morning, finding a couple of good locations and getting some good shots at Vogl, N of Großkarolinenfeld. Then off to the other side of Rosenheim and a nice location at Eizing, around 6km to the east on the line to Salzburg. It was turning out to be a glorious sunny morning. Next stop was Inzenham to try another location I'd seen the previous day. It turned out to be a cracker but the light suddenly died after what had been an exceptionally good morning. Time to move on. Off to the east in a forlorn attempt to outrun the cloud. It was certainly brighter than in the west but not really sunny. The first destination was the big curve at Axdorf, just west of Traunstein, a superb location but it needed the sun. I continued east, stopping at a spot east of Traunstein that would have been good for the 111s on a brighter day. Finally went to find a location I'd seen pictures of on the web. The spot at Hörafing, east of Teisendorf turned out to be an excellent position but it needed the light and there wasn't a lot around. Gave up after an hour and returned to Rosenheim and the luxury of a relaxed evening meal and a few beers. A dull overcast start with no let up in the weather forecast. Most of the morning was spent looking at positions south of Ostermünchen before returning to Rosenheim. My plan to leave the car at the hotel and take to the rails was thrown into disarray because there were no parking spaces left. The car was eventually abandoned in a nearby housing estate to be recovered later. Travelled on a Meridian unit to Kiefersfelden, last stop before Kufstein, to avoid a 1 minute leap onto the next unit back or a 1 hour fester if I missed it. Back to Rosenheim and onto the next Salzburg train, worked by a pair of 111s. Off at Freilassing and up to Berchtesgaden and back on a Flirt before returning to Rosenheim on a unit. The third 111 set was seen to be back on the 16:35 from München, albeit running 20 minutes late. After retrieving the car and parking it at the hotel, it was off to München Hbf for a night photo session before returning to Rosenheim on the last 111 worked train of the day. Of note was that the trains expected to be worked by 182s on Metronom dostos were all units and a rake of Metronom dostos was parked up at München Ost without locos attached. The obvious conclusion is that the 182s had finished some time earlier. Plenty of spots were found during the day with Rosenheim - Freilassing the best section by far, particularly east of Bergen. From not far west of Bergen to Bernau looked fairly useless and from Bernau to Rosenheim, all the potentially good locations were already known. On the Kufstein line there were a few reasonably open locations north of Flintsbach but none of them looked particularly special. Fischbach, S of Flintsbach to Niederaudorf, N of Oberaudorf looked much better than the rest with shots on both sides of the line for trains in both directions. The Berchtesgaden line looked difficult for most of its length but there were open spots with mountain backgrounds on both sides of the line near the summit between Hallthurm crossing loop and Bischofswiesen. On the Rosenheim - München line the only spots noted were in the Großkarolinenfeld - Ostermünchen area, as already found. Night photography at München Hbf was more difficult than expected with the main train shed much gloomier than anticipated. The D700 struggled with the low lighting but the D600 coped much better and just about managed shots of moving trains at 1/125 sec on ISO2500. Note that many more trains were seen but these were the only ones recorded. Again these are only a fraction of the trains seen. Quite a busy day with a lot of driving to get to reasonable spots for the final day of the 111s. 111.049+111.046 were caught at Vachendorf, near Traunstein, Baierbach, near Rosenheim, Weisham, near Prien, and Hörafing, near Teisendorf before bad light stopped play around 15:30. The other working of note was the ECS of the other two 111 worked sets returning from Freilassing to München with three 111s at the front and one at the back. Only the first two were powering though. The rest of the afternoon was spent on an exploratory trip to the Berchtesgaden branch where the 1016 was photographed in poor light at the locations seen from the train the previous day. The shots would have been worth having if the sun had been out. A day of rest and quiet contemplation. It rained during the morning so I sat in the car and watched the trains coming and going at a couple of spots east of Rosenheim. There was a surprising amount of freight in the morning but it soon dried up. No 111s alas, Saturday really had been the last day. During the afternoon the light improved and I went to try a spot near Bad Endorf, getting one shot in hazy sun there before the light went. The rest of the afternoon was spent south of Prien where, despite looking promising at times, the sun remained stubbornly behind the clouds. A brilliantly clear sunny day at last. The morning was spent at Gutmart between Großkarolinenfeld and Ostermünchen where there was plenty of freight, particularly early on. This is a good morning position where you can walk round the curve as the sun goes round. It was nice to get a wide variety of traction including a 151, SBBC, BLS and Trenitalia engines on southbound trains but frustrating to miss a real 194 in green going the other way on hoppers. Moved on to Baierbach for the middle of the day, staying until the light moved round far enough to photograph the line to Kufstein. Unfortunately stayed too long, making the afternoon difficult. Tried several locations between Flintsbach and Oberaudorf, finding some super spots in places identified from the train. Getting the shots was difficult as there wasn't much freight about and the long gaps between hauled passengers meant that it was a losing battle with the shadows most of the time - must try again! Although the forecast was poor there was quite a lot of blue sky first thing. Went to a spot near Ostermünchen first and got three shots in sun, admittedly one was a unit and another an ICE. By 09:00 the sky had filled in. It still looked fairly clear to the south so I went to Niederaudorf again, arriving just as the light died. A useful morning checking out shots on the east side of the line. There were some good ones but they need to be done early before the light gets too far round. Similarly the afternoon was spent sussing out spots on the west side of the line. There aren't many good spots for SB trains as it's difficult to get the mountains in. Northbound locations are much better but, hauled trains were thin on the ground at the right time of day. There were plenty of units and RailJets being shoved but not much else. Left for the airport about 17:30, much earlier than necessary, but there was no chance of the light improving and the sun would have been behind the mountains at the best spots even if there hadn't been clouds in the way.